I was so excited to receive a sneak peek at Barbara Barry’s new accessory introductions for Global Views that I had to share it with you all right away! 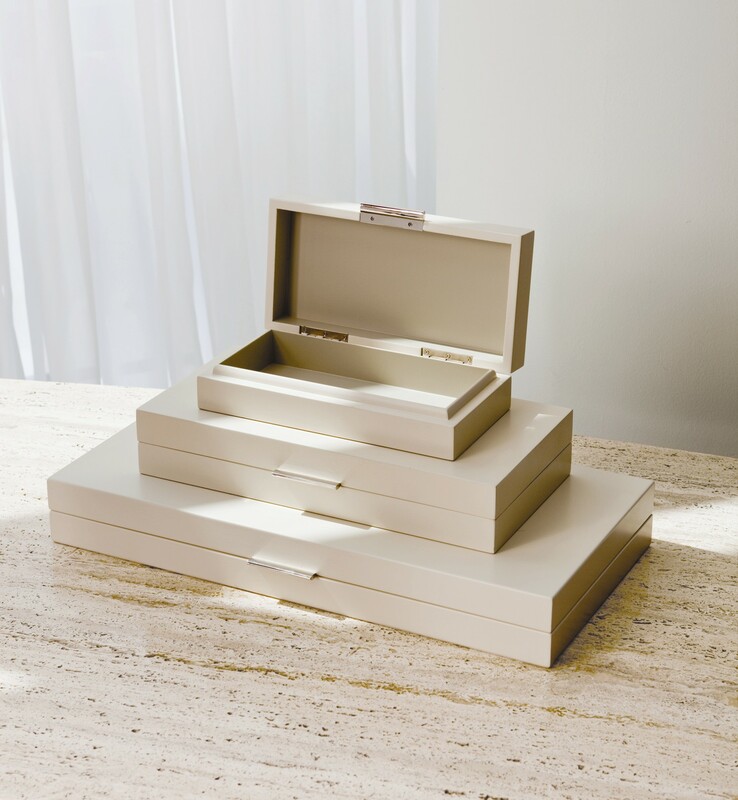 The elegant line contains ceramics, trays, boxes and other fabulous accessories that depict the timeless sophistication that Ms. Barry is known for. She has selected an assortment of amazing finishes including laquer, leather & silver leaf detailing. This might be my favorite piece. I love to add a tray to a room. They are so versatile. Display pretty perfume bottles on them in your bathroom or use them to group or organize cell phones, keys, pens & to-do lists. 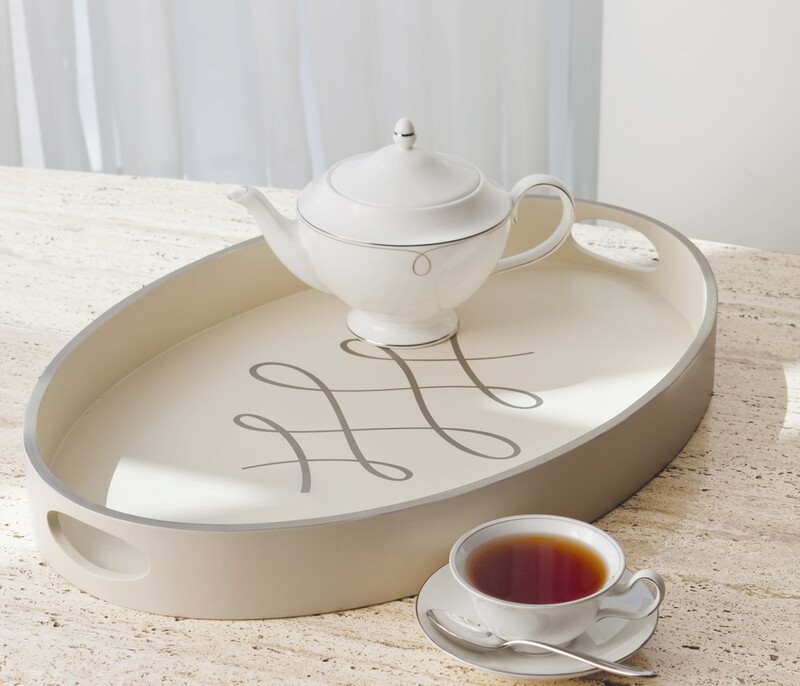 Bring them out to entertain with when you have a party or use it to serve your sweetie coffee or breakfast in bed. Set one up in a guest room on a nightstand or dresser with items to make your guests feel welcome (fresh cookies, magazines, bottled water & a toothbrush & toothpaste). 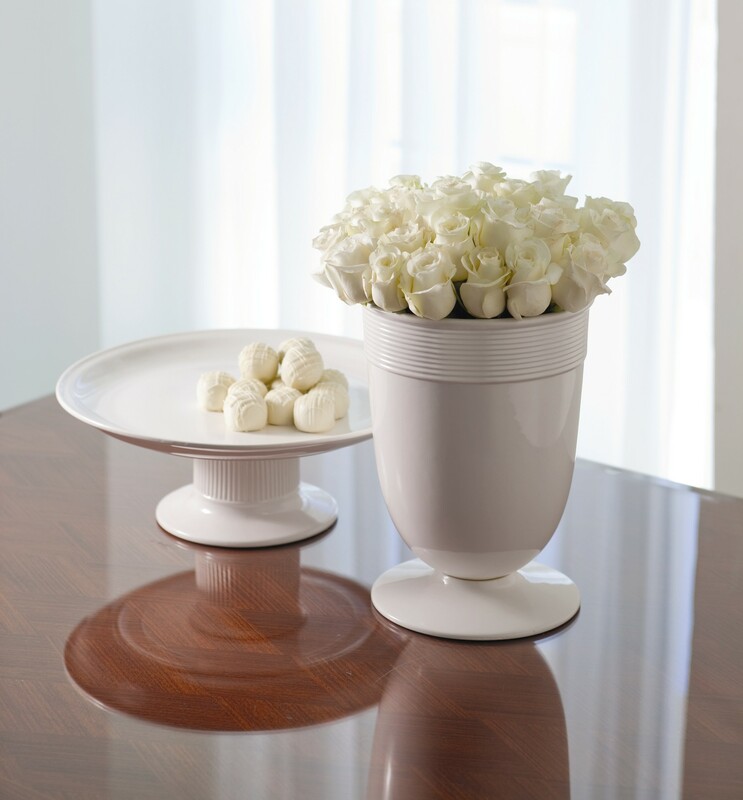 You know I love to entertain, so of course I love this vase & footed serving piece. They have such a fresh clean look. I can just imagine displaying a fresh bouquet of flowers in the vase & arranging yummy muffins on the serving piece to have coffee with girlfriends. This sleek set of laquered boxes offer both form & fuction. Perfectly sized to conceal pens, pencils, keys, or jewelry this should be on everyone’s “must have” list. Global Views is one of my absolute favorite home accessory lines. They also happen to be one of my favorite showrooms to visit at market. I can’t wait to see them this weekend when we embark on our bi-annual shopping spree in North Carolina for home furnishings & accessories for IBB. Market is like fashion week for the interior design industry. I’m like a kid in a candy store there. By the end of the trip, my head is usually spinning from all of the fabulous finds that caught my eye. AND, if you’re a designer & you’ll be at market, you won’t want to miss our Tweetup at Global Views on Sunday, April 18th. Click here for details & to RSVP.